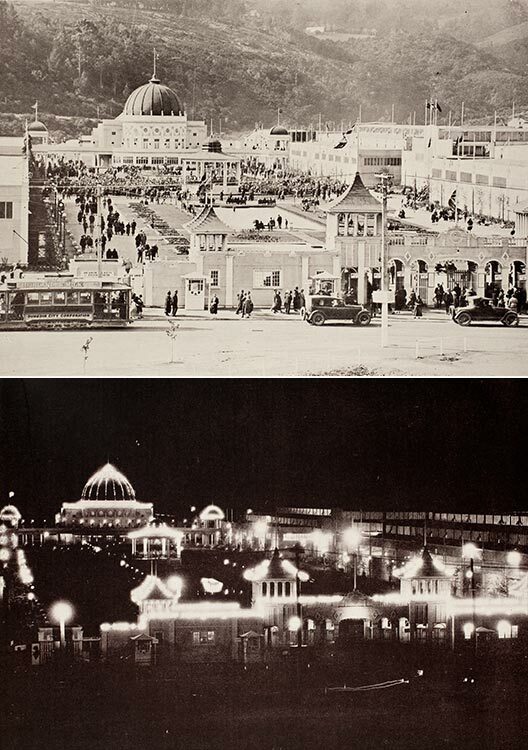 These two photos show the same scene of the Grand Court of the New Zealand and South Seas Exhibition in Dunedin by day and by night. The scene by day shows the Festival Hall in the distance, while in front are flags, reflecting pools and a band rotunda, which made this a major gathering point for the thousands of visitors. This was the most popular exhibition in New Zealand history. The scene at night shows the spectacular lighting showcasing the power of electricity, which was becoming more widely available in the 1920s. The lighting also provided a beacon across the city and created a sense of progress into the future. The exhibition was held at Logan Park.